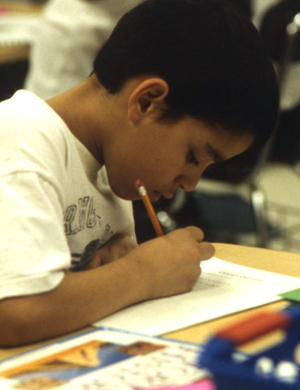 Perhaps the most controversial issue in education policy is test-based accountability. Since the 1980s, most states have had tests in reading and math (at least), and have used average school test scores for purposes ranging from praising or embarrassing school staffs to providing financial incentives or closing down low-scoring schools. Test-based accountability became national with NCLB, which required annual testing from grades 3-8, and prescribed sanctions for low-achieving schools. The Obama administration added to this an emphasis on using student test scores as part of teacher evaluations. The entire test-based accountability movement has paid little attention to evidence. In fact, in 2011, the National Research Council reviewed research on high-stakes accountability and found few benefits. There’s nothing wrong with testing students and identifying schools in which students appear to be making good or poor progress in comparison to other schools serving students with similar backgrounds, as long as this is just used as information to identify areas of need. What is damaging about accountability is the use of test scores for draconian consequences, such as firing principals and closing schools. The problem is that terror is just not a very good strategy for professional development. Teachers and principals afraid of punishment are more likely to use questionable strategies to raise their scores—teaching the test, reducing time on non-tested subjects, trying to attract higher-achieving kids or get rid of lower performers, not to mention out-and-out cheating. Neither terror nor the hope of rewards does much to fundamentally improve day to day teaching because the vast majority of teachers are already doing their best. There are bad apples, and they need to be rooted out. But you can’t improve the overall learning of America’s children unless you improve daily teaching practices for the top 95% of teachers, the ones who come to work every day, do their best, care about their kids, and go home dead tired. Improving outcomes for the students of the top 95% requires top-quality, attractive, engaging professional development to help teachers use proven programs and practices. Because people are more likely to take seriously professional development they’ve chosen, teachers should have choices (as a school or department, primarily) of which proven programs they want to adopt and implement. The toughest accountability should be reserved for the programs themselves, and the organizations that provide them. Teachers and principals should have confidence that if they do adopt a given program and implement it with fidelity and intelligence, it will work. This is best demonstrated in large experiments in which teachers in many schools use innovative programs, and outcomes are compared with similar schools without the programs. They should know that they’ll get enough training and coaching to see that the program will work. expanded opportunities to make wise choices for their children. Just as evidence in agriculture informs but does not force choices by farmers, evidence in education should enable school leaders to advance children’s learning in a system of choice, not compulsion. If schools had choices among many proven programs, in all different subjects (tested as well as untested), the landscape of accountability would change. Instead of threatening teachers and principals, government could provide help for schools to adopt programs they want and need. Offering proven programs provides a means of improving outcomes even in untested areas, such as science, social studies, and foreign language. As time goes on, more and better programs with convincing evaluation evidence would appear, because developers and funders would perceive the need for them. Moving to a focus on evidence-based reform will not solve all of the contentious issues about accountability, but it could help us focus the reform conversation on how to move forward the top 95% of teachers and schools—the ones who teach 95% of our kids—and how to put accountability in proper proportion.